This page is dedicated to the birds who have been documented to being over 30 years of age. 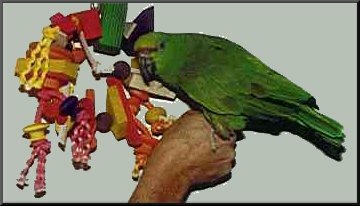 Please send in your stories (pictures welcome too) of your "senior psittacines". Give age or approximate age, how documented, species, type of diet and environment and anything in the bird's history that may be relevant to its age. Submit here with SENIORS in the subject line. Fred is 100 years young this year (2014). He resides at the Bonorong Wildlife Sanctuary in Australia. The Queen of England sent him well wishes. Photo courtesy Mimi Grzymala. This is a 104 year old Double Yellowhead Amazon that resides at the Mega Bird Store in Cocoa Beach FL. The owner of the store became heir and caretaker of this marvelous Sr. Psittacine when it was handed down through the years from her family. "Zachary" was 89 years old when she inherited it from her Mom. She's had it ever since. The beautiful Amazon only has some arthritis and is otherwise healthy. I don't believe the bird has ever been sexed to determine the gender, but it sure does look like a hen to me. 87 Year Old (2013) Macaw. Click here for pictures and story. Cookie, a Major Mitchell’s cockatoo, is the only animal at Chicago's Brookfield Zoo that is from the original collection dating back to the zoo’s opening in 1934. He has been permanently off exhibit since September 2009 but will be making a special appearance on his big day, June 29th 2013. Miki is a Festive Amazon who has been with Barbara from N.C. for more than 40 years. In this picture, you can't see his pretty red rump. He grew up with my kids and knows the names of dogs that are long gone. He now lives with 18 other pet birds, almost all of them close to 10 years old or older, and is as happy as ever. There are very few Festive Amazons in the US. No one has been successful in breeding them. Cherane Pefley bought and received Mikee in Jan. 1993. According to the Smithsonian's records on Mikee, he was hatched in October 1964. Mikee was six months old when he was brought into this the USA and lived on 5th Avenue in New York City with Mr. and Mrs. William Burden till Oct. 1985. Mrs. Burden donated Joe Crackers and his mate of many years to the Smithsonian DC, which they in turn gave to Disney World in Orlando . Mikee then came here. However, his long time mate is (hopefully) still in Disney World. SkipaRue has been his mate for the last 5.5 years. She is 12 years old this past July 16. I brought her here in March of 1993. - Cherane Pefley, owner. "Sunny" was purchased from an importer/wholesaler in the late 70s. At that time, he had a full yellow head all the way down his neck. As soon as he was provided a mate, they produced beautiful chicks. Sunny died of vascular disease circa 2008. I estimated him to be minimum age of 50 to 70 or more at that time. He was owned by Planned Parrothood®. 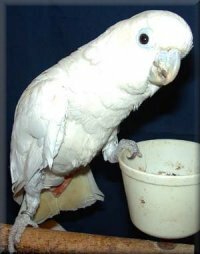 "Mimi" is a Red-Vented Cockatoo from the Philippines. She is over 30 years of age and is a real sweetheart. She talks and will go to anyone. She loves to sit on your shoulder and watch the Disney Channel! She is owned by Joe Baker of Birds of Paradise Aviary in Hawaii. 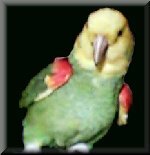 "Bongo" is a 30+ year old Bluefront Amazon owned by June DiCiocco of Hideaway Farms Aviary. "PRICILLA & PHILLIPE" & "EDITH & ARCHIE"
Two retired pairs of macaws arrived at The Oasis last year. "Pricilla & Phillipe", the Scarlets, were put together as a pair in 1974, as were "Edith & Archie", the Blue and Golds. "Edith and Archie" are both estimated to be at least 40 years old. During Edith's years in captivity, they produced over 200 babies together. When Edith stopped being as productive as she had been, her owner decided to place her at the Oasis where the two could enjoy the rest of their lives without the pressures of breeding. Pricilla and Phillipe are an odd couple. Based on past history from owners as well as xrays taken in 1993, Pricilla is estimated to be around 75 years old. She is blind in one eye, developing a cataract in the other and has severe arthritis in her feet, limiting her mobility. Her husband, who is estimated to be in his 50's, is extrememly protective and caring of her. Of all the birds here, Pricilla and Phillipe exemplify the loving bond mated macaws develop. I will try to get some information on how to determine the approximate age of a bird from our vets. For instance, upon necropsy of my old scarlet macaw hen, the vet said that he could tell she was very old by the look of her ovaries. Will try to supply more info on this.